The automaker has been building self-driving Bolts at its Orion Assembly Plant in Orion Township, Michigan, since January. Unlike GM's earlier self-driving test vehicles, the new cars were built on the same assembly line as regular Bolts that are being sold to customers. Once they rolled off the line, the self-driving Bolts went to another area of the plant to get computers, sensors and other hardware installed. The cars use software from Cruise Automation, a self-driving startup GM bought in 2016. 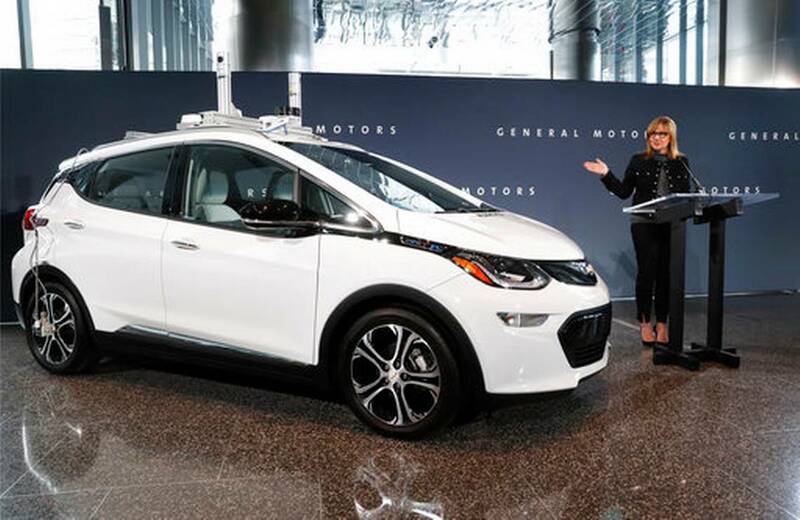 GM CEO Mary Barra wouldn't say Tuesday if the company plans to make more self-driving Bolts. What GM is doing is similar to what Waymo and Fiat Chrysler did last year, says Sam Abuelsamid, a senior analyst with Navigant Research. Fiat Chrysler assembled 100 hybrid Chrysler Pacifica minivans with modified wiring and then sent them to Waymo, which installed the hardware and software needed to make them self-driving. Fiat Chrysler is currently building an additional 500 Pacificas for Waymo. The main difference is that GM is doing the modifications under one roof, Abuelsamid said. But he thinks all automakers will soon be mass-producing vehicles that are modified for self-driving as they start to build up larger test fleets. "It makes sense to do that engineering up front, because otherwise you have to tear up the car later to add the hardware," he said. GM eventually plans to place self-driving Bolts in ride-hailing fleets in major U.S. cities. But unlike other automakers ? who are generally targeting 2020 or 2021 for autonomous vehicle fleets ? Barra is giving no target date. She said the company has set internal targets, but it's not announcing them because it wants to make sure the vehicles are safe before they're released. "Gaining our customers' trust is extremely important," she said. The self-driving version of the Bolt is equipped with GM's second-generation self-driving software and hardware. The cars have multiple cameras and 40 sensors, including a radar system that scans around corners for oncoming traffic. Five spinning Lidar cylinders on top of the car use lasers to make a three-dimensional map of the area as the vehicle is driving. GM won't say how much each vehicle costs. GM has been working with Lyft on autonomous vehicle research since early last year, when it invested $500 million in the San Francisco-based ride-hailing company. More recently, Lyft has partnered with some of GM's rivals, including Waymo and Jaguar Land Rover. It's unclear how Waymo's tie-ups with both Lyft and Fiat Chrysler will impact GM. But Barra said GM's partnership with Lyft was never meant to be exclusive. "We're working together in one space and competing in another," she said. Karl Brauer, the senior director of content at Cox Automotive, says no single company is doing everything related to autonomous driving as well as companies working together, like Waymo and FCA or the recently announced collaboration between BMW, Intel and Mobileye. But he said GM seems to be the furthest along in terms of its partnerships ? with Cruise and Lyft ? and development of self-driving cars. GM shares were down 11 cents to $34.57 in early afternoon trading.